It seems that everyone wants to push the seasons. I haven’t even raked the first fallen leaf and already the mailman has delivered the first seed catalog of the season. It’s from the same company that sent the first seed catalog in past years, at least according to my garden journal. (Well sure I write down in my garden journal when I get my first seed catalog each year. Don’t you? I don’t record when all of the catalogs arrive, there are too many for that, but I generally note when I get the first one. I have a whole process for dealing with seed catalogs and seeds, but I don’t really start that process until after the first of the year. For now, I just let the seed catalogs pile up in a corner and keep my attention focused on the beauty of fall in the garden and the upcoming holidays, and try to enjoy it all, one event at a time. Then after the first of the year, I open the seed catalogs and let the dreaming begin. I wouldn’t even think of gardening without seeds, but I’ve heard rumors that there are some actual gardeners who don’t “do seeds”. At first, I didn’t believe it. But as I’ve written and posted about seeds, I’ve gotten a few comments and emails from some of these “seedless gardeners”, so I know they exist. They have their reasons, and I suppose those reasons make sense to them. I just don’t quite understand them and their “don’t” or “can’t” attitude about seeds. There’s very little about gardening, including seeds, that I won’t try at least once, as long as it is legal, but that’s a subject for another post. For now, I’ll just try not to be a haughtyculturist about this whole seedy business. But I will say embrace seeds for a happier life. Buying seeds is often the only way to get many varieties of vegetables and some flowers. Sowing seeds can be a more economical way to grow some plants, especially easy to grow annuals, vegetables, etc. Sowing seeds is often the best way to ensure success with many flowers and vegetables and other plants that don’t transplant well. Sowing a tiny little seed, maybe one that is no bigger than a gnat’s eye, and watching it grow is a very rewarding experience. Embrace seeds for a happier life. Oh boy Carol. I have certainly embraced the purchasing part of seeds. I just don't always get them into the ground. This year I expect to try that winter sowing. I want to use the milk jug process during winter to get a jump on that seed sowing process. This means that I will have to create a new area to plant said seeds. Something to look forward to. Embracing. Yes,as Martha would say "a good thing". I have a seed addiction ... In past seasons, my husband has had to physically drag me away from seed packet displays. There are people who actually garden without seeds? Say it ain't so! LOL! I definitely "embrace seeds". I can't imagine missing the pleasure of watching a tiny seed become a beautiful flowering plant. I've been going outside every few days collecting seeds from some of my favorite plants. Hmm. I haven't gotten mine yet. I wonder if they finally gave up on me? I have cut way back on what I start from seed because right when the seedlings need the most attention I am going outside and working on the early spring garden. I just hate to see seedlings die! But I had fun doing some winter sowing last year. Will probably do that again. I deal with seeds most of the year. If I'm not planting them, I'm collecting, drying, packaging, or trading them! BTW, I'll take the T&M catalog anytime of year....it is surely eye candy for the gardener. I, too, have read about these "seedless" gardeners--that they can't be bothered with the "fuss" or that seeds are somehow scary. I don't get it. I love growing things from seed. In fact, my downfall is that I often lose interest in a plant after it's moved past the seedling stage. It's sort of like children. I love to nurture and coddle them as infants, but can't stand the maintenance when they're in their teens. I used to think I grew plants from seeds because I couldn't afford to buy big plants. But over the years I've learned the real reason I do it is because I like watching plants grow. Trees and bushes and large perennials have their place. But usually they're just there--providing bones. Watching an annual veggie or flower grown from a seed is experiencing an almost daily transformation. Maybe I just have a short attention span. Well, I have embraced seeds, but I am not sure they are hugging me back. Hi Carol, this is a great public service announcement. 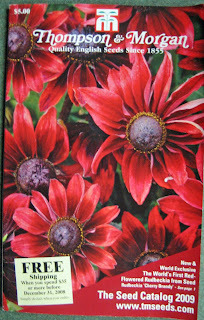 I got that catalog too and really like the rudbeckia on the cover, THE FIRST RED RUDBECKIA!!!! They always are trying for that next big thing, but T & M is a good company, I try and buy from them and others to spread the wealth, good for the economy you know. I cannot imagine gardening without seeds, how do they grow their veggies? Or do they not bother with food??? When I'm frantically looking for another inch of free space in the garden for all the seedlings I've started, I think I've embraced too many seeds. Fortunately, I forget all about that by the time the seed catalogs arrive again. Like MSS, I get great satisfaction from watching a seed turn into a plant. People garden without seeds? My first dianthus came from seeds (T&M BTW). All twelve of the little plants had slightly different growth habits and their flowers were slightly different. Over the years only one has survived. The rest weren't either worthy of the garden or couldn't survive the heat/wet/cold/whatever of my garden. If I had bought the plant from a nursery would I have gotten the exact right one that loves MY garden? I think not. Embrace seeds for genetic diversity. It's funny, I direct sow and for a few seconds thought I might technically be a seedless gardener! It's been difficult to manage plants inside...No basement or garage. If we decide to put in the vegetable garden this fall...I will have to embrace more seed planting! My favorite seed catalog is Chiltern Seeds, the vegetable catalog is always an enjoyable read! I have ordered from them. 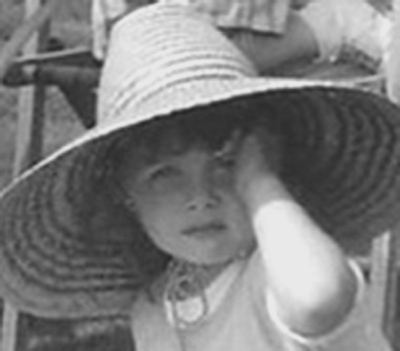 I've been lurking here, Carol, pondering what to say--am I that seedless gardener everyone scorns? And then I realized, no, I'm not! But I must admit I like to buy tomato seedlings someone else has planted, and my first attempt at starting seeds indoor this year didn't go so well. But I've been collecting some seeds already and am determined to do a better job this winter of raising some seedlings myself. After 35 years of starting seeds on a makeshift table in the kitchen I finally got my greenhouse. It is bursting at the seams with seedlings in the spring and cuttings in the fall. When it's 100 degrees in the summer it gets a good sterilization. I am a new gardener this year with bigger plans for next year, and have a question for you old-timers about ordering from catalogs. I got on an email list for Gurney's but I've never ordered seeds or plants from a catalog or online. I am looking at some seeds that say will be shipped in my proper planting time which according to the chart is up to Nov 7. I live near Detroit, I didn't think I could be planting seeds in November! What if I order a plant that will be shipped in spring - am I making a reservation and paying later, or am I paying now and hopefully they send me a plant in the spring!! Sorry to be so dumb, can someone help me? Much to my horror I opened my mailbox today and discovered a freshpak from Gardens North of Corydalis ochotensis var. raddeana....darned if I can remember why I ordered it, or what it looks like. That's what happens when you order seeds in Jan and they're delivered in Oct. I once read a wonderful piece about the miracle of seeds. Take a watermelon seed:smaller than your smallest fingernail yet it becomes something that is 65,000 times bigger than its original size and provides sustenance and the seeds for the next crop x 500 more seeds. (OK, I am not sure about the 500). Okay, Carol, while I'm not seedless - for tomatoes and peppers I only buy little starter plants. Since I only want one or two of a variety it would be goofy to embrace 8 packages of seeds to get a dozen plants! Like Gail I have no place to start them inside. I direct sow annuals and vines. The chipmunks ate all my seed except for the Zinnias and some giant sunflowers. I would say I'm one of the discouraged ones. I had such hope. I will try and enjoy this season without planning to much for the new possibilities. You didn't even peep to see? I too love seeds, saving my own and pouring through the catalogs. I have an unheated hoophouse to over winter plants that are just a zone or two warmer than here(zone 5/6) and to start seeds. I have tried a winter garden of leafy plants and an early spring sowing in there. But I lack a place to begin seeds of other plants very early. I would encourage Terry to check out gardenwatchdog.com for their info on mail order firms. and then just plunge in! Thanks Acorn! I did a very quick check on Gurney's and decided I would not be ordering from them as they have too many negative comments. Love, love, love catalogues even though I hardly ever purchase anything from them. As for the BSSS? Are you saying something? Oops, forgot to mention that I suppose that there are some seeds that could be tossed on the garden now like poppy, sunflower, cosmos, nicotina and other self starters. But I agree, I don't want to rush the seasons and fall is fantastic. I'm a compulsive seed saver. Paper bags from the grocery and liquor stores, coin envelopes purchased at an office supply store, tiny plastic storage bins ... I've got all those and more stuffed with seeds! I don't buy a lot from catalogs or online, but I love to peruse the catalogs and THINK about it. I bought Linaria maroccana/Toadflax from Wildseed Farms in 2006 or 2007. I think I still have some of those seeds left, but of course I've been saving the seeds from their offspring too!